Procter & Gamble debuted its newest tool in the fight against aging. At CES this week, the company introduced the world to “Opté,” a handheld device that prints anti-aging product on top of your skin, acting as a real-world Photoshop, essentially. Opté covers up hyperpigmentation, or age spots, by gliding a device the size of an electric shaver over the skin‘s surface. Using blue LED lights, the device maximizes contrasts in melanin before using onboard cameras to take more than 200 images per second. Images are then sent to a microprocessor that analyzes 70,000 lines of code to determine the size, shape, and intensity of each blemish. 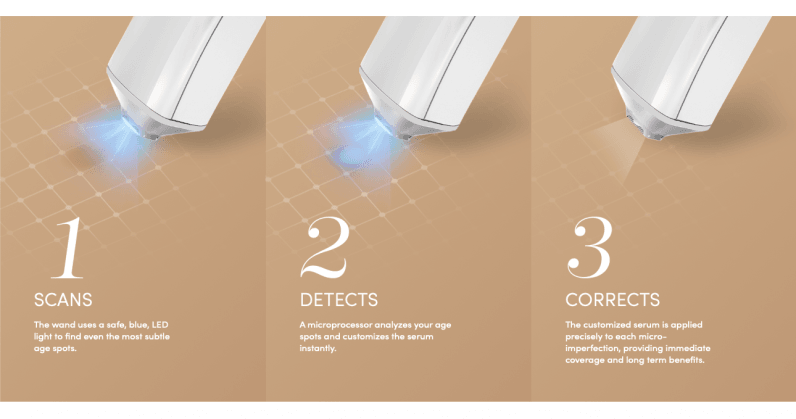 After photographing and analyzing the skin, a tiny onboard printer with 120 nozzles, each thinner than a human hair, deposits a specially-formulated skin care serum directly to the problem area — foregoing solution on areas where it’s not needed. According to Procter & Gamble, its internal inkjet printers can reproduce any skin color, starting with cartridges for fair, medium, and dark skin as a base. For anyone currently wearing makeup to cover blemishes, the company says, this could replace it entirely. And, bonus, it won’t sweat off like traditional concealers. It’s not just a concealer, though. Opté could, over time, reduce the appearance of these blemishes with anti-aging ingredients used in the coverup solution. Pricing information is still up in the air, but Procter & Gamble plans to release the device later this year, or in early 2020.